We got an early start and headed out for breakfast on Galveston Island before going over to the Galveston Cruise Terminal for boarding. On the way over, we stopped at Wal Mart to pick up a few things we’d forgotten or intended to pick up down there. After we were dropped off, we got our luggage checked and proceeded to queue up for security screening and passenger check-in. The security screening was what I fondly remember as a pre-9/11 process, with just baggage x-ray and metal detector. We were through that in no time flat and in line to get checked in. After receiving our cruise cards and a packet of information about the ship, we queued up again to await boarding. Once we were called, boarding was pretty quick, though the elevator traffic on the ship was pretty crazy. We opted for the stairs, as we are planning to do throughout the cruise and headed for our stateroom. 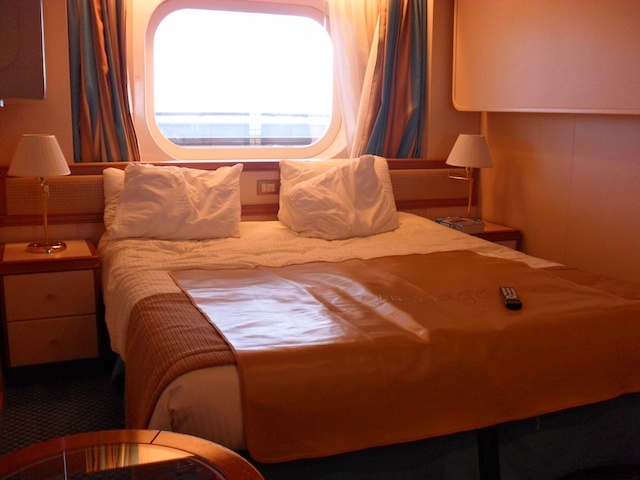 We’re on the Crown Princess, one of Princess Cruises‘ ships, staying in an ocean view stateroom on deck 8. It’s all the way forward, on the starboard side, above and behind the theater, which is on decks 6 and 7. We’re a little concerned about noise from the shows, but we’ll see how things go. We bumped in to Antonio, our cabin steward, while getting settled, and introduced ourselves. The cabin is nice, larger than our initial cabin, which was an interior on deck 15. Thanks to a last minute upgrade from Princess, we got this one, which is nice because having that window and some natural light is more enjoyable. After dropping our stuff, we went down to the passenger services desk and signed up for the ship’s tour, and then up to deck 15 for some lunch. Hopefully we’ll get on the tour, but that depends on how many people sign up. Following all of that, we nosed around the ship, familiarizing ourselves with the layout and features. It’s really nice, bigger than I would have thought, and we don’t feel crowded, even though there are about 3,000 people on board, plus crew. From there, we went back up to deck 15 to watch the sail away. It was a bit chilly, but fun. 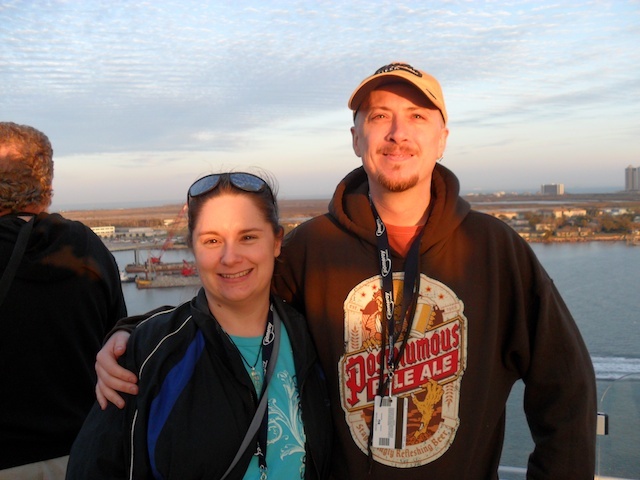 We met two couples from Canada and talked with them while we sailed away. Finally, after getting out of Galveston Bay and into the Gulf of Mexico, we went back down stairs to our cabin, where our luggage, including the case of bottled water we’d slapped a luggage tag on, were waiting for us. Everything arrived intact, and there was plenty of storage for all of our clothing, casual and formal, for the entire week. After unpacking, we got dressed up and headed down to do our first dinner. Since we chose flexible seating instead of a fixed dining time, there was a little bit of a wait. But it wasn’t any different than heading out to eat at a normal restaurant. In fact, the wait was shorter than many places we’ve been. We told the hostesses that we didn’t mind being seated with other people, and ended up at a table with three other couples. The service was great, the food was excellent, and the company was enjoyable. We spent some time getting to know each other, and enjoyed a delicious meal. Since we were pretty worn out, we headed back to the cabin and crashed out for the evening. It was a busy day and we really just didn’t have it in us to party all night. It’s not really our thing anyways, so it’s all good. Tomorrow is the first full sea day, which should be interesting, since Heather’s never been out of sight of land for as long as we’re going to be. Here’s a shot of the cabin and one of us at sailaway. This entry was posted in Food and Drink, Travel by Pat. Bookmark the permalink.